Unveiled in March, the eve of the Amusement Expo, the new Big Buck is now available! This series of hunting games developed by Play Mechanix is very popular in the U.S.A. where it appeared in TV shows. 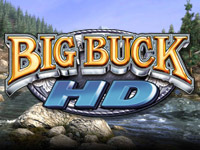 As its name suggests, Big Buck HD sports a high resolution (1080p). And it's true that the graphics are impressive (video)! Regarding new content, there are new dangerous trophy animals such as tigers and bears that attack you. The game can be connected to the internet by ethernet, wi-fi and even cellular connection in order to offer online rankings, online games, Facebook and Twitter integration and of course tournaments where players can win money. As in Dirty Drivin', an achievement system is integrated. Each achievement grants a badge and unlock a new challenge. The player can check his status via his free Big Buck Online account. The game is updated automatically via CoinUp for connected machines. The standard version of the cabinet features a 32" screen but there is also a "Panorama" model which is cheaper but has no screen. It's up to the operator to attach a screen of 42", 47" or 55". Another novelties is the ability for the player to pay using debit and credit card. No doubt that Big Buck HD will meet the same success as its predecessors. In Europe, this game can be purchased from Namco.